Jose (Joey) Buitron had no idea his body was fighting a hard battle while training for the Chicago Marathon, he just assumed he was tired. As an allergy sufferer, Buitron attributed his exhaustion to a sinus infection and scheduled a visit to his doctor. It was through standard bloodwork that his doctor’s office found some issues with his platelet numbers. Fast forward to a year later, the 46-year-old underwent six rounds of aggressive chemo and has returned to his training routine. Q: What goes through your mind in deciding which marathons to run? A: It never really mattered before, but now I try to think about the cause behind the race. In February, I will run the Jail Break Run half-marathon to support Project Blue, a 501(c)3 nonprofit organization formed to help officers who face serious illness or injuries outside the line of duty and fund criminal justice scholarships. They were there for me in my time of need, so it’s time for me to help other officers that may be in a difficult situation. Q: What causes do you run marathons for? A: I never did have a cause, but that’s changed now. I’m a leukemia survivor. I’ve always ran for my own health and wellbeing, and I know that has helped me during my treatment. Now I run for so many more reasons. My health, to give God glory, to give people hope, for my family and without wanting to, now I run for awareness. 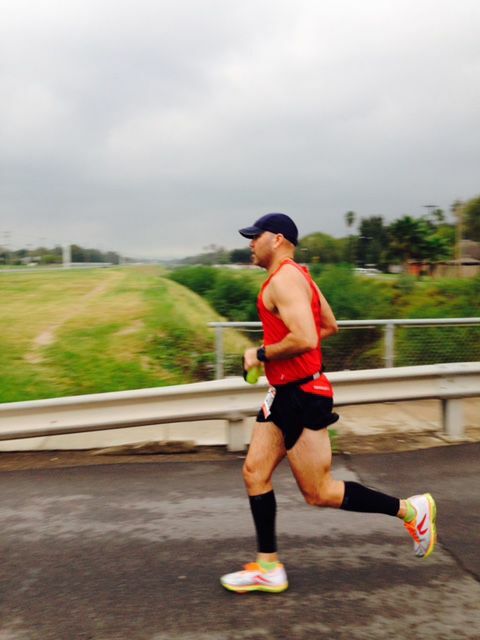 Q: Will you be participating in the McAllen Marathon in January? A: YES! Most definitely! Running in our home town is extra special. Got to support my city! The Running community has given me so much love and support, I have to be out there. This year I’ll be doing the relay with some close friends and family that don’t know they’ll be doing it yet. Lol! I also encourage my two boys to run since it’s a big part of our lives. My 10-year-old will be out there running and he will ask his friends to join in the Kid’s marathon. Q: What benefits to you see from running, both physically and emotionally? A: Running literally saved my life. I went through six rounds of hard aggressive chemo, and still continue a maintenance chemo twice a month, running conditioned my heart and body to withstand this poison that was pumped into my body. Physically it has made me strong and emotionally it improves my mental health, helps me relax, and clears my mind. It’s my alone time with God. I’d like to thank Dr. Theresa Valledares for being persistent and saving my life. I also have to thank Dr. Steven Kornblau, my doctor at MD Anderson for getting me through this. And of course I thank my Lord and savior Jesus Christ! I am very blessed with a long list of people to thank, and if I had to list everyone individually, I’d never finish. But I have to thank my wife Iris, for staying by my side every step of the way, and my two beautiful boys Sebastian and Joaquin for staying strong and always taking care of me.